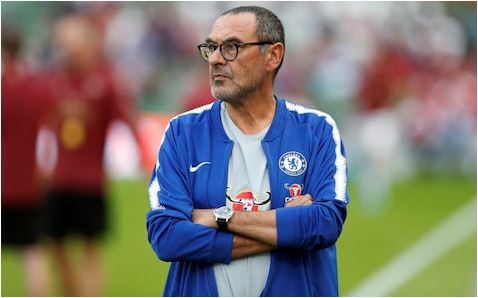 Maurizio Sarri sprung something of a surprise for Chelsea’s Europa League opener with PAOK by playing a strong side and not making quite as many changes as many thought he would. In the end the Italian rotated five of his players, while there was no space for Ruben Loftus-Cheek, Callum Hudson-Odoi or Ethan Ampadu in the starting XI, with the latter two not even making it into the matchday squad. With a busy schedule coming up in the next few weeks as they take on West Ham at the London Stadium in the Premier League on Sunday before travelling to Anfield to play Liverpool in the Carabao Cup. They then have to host Jurgen Klopp’s side the following Saturday in the league which could be a battle between the two teams still unbeaten when they face at Stamford Bridge. However, the Blues made the perfect start against PAOK when Willian scored in the seventh minute and Sarri has defended not giving more players like Jorginho and N’Golo Kante a rest. “It is very important competition,” Sarri told BT Sport before the game. “It is an unusual competition because at the moment we don’t know the opponents in the second round when teams come in from the Champions League. It’s very important and I think very difficult. “We have changed five players in the starting eleven but we have a lot of matches in a few days so it is important to change, not to much but to change.